As many of you may not know, I am currently working as a TA in a class that focuses on the Downtown Scene, both literary and visual art, in NY from the 1970’s until the 1980’s. 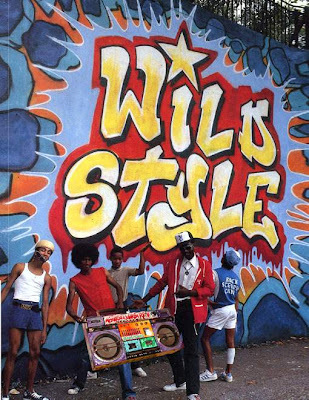 Two weeks ago we watched Wild Style, and before that Downtown 81. So you can imagine my surprise when picking up an AM New York Thursday morning on my way into the subway that featured the title and photograph claiming “Historic graffiti mural discovered in Manhattan building”. Really? My attention peaked, I read the accompanying article, by Associated Press Writer, ULA ILNYTZKY. 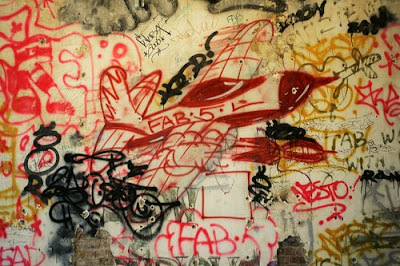 -NEW YORK – It was the stuff of urban legend: Rumors that a historic SoHo building had important graffiti hidden in its walls. Except, in this case, it was true. A large mural that was created by some of graffiti’s earliest pioneers was discovered recently in a 10-story limestone building just as developers were converting it into luxury condominiums. Can this be true? Are we really there yet? What is it I’m speaking of you ask? Why the abundance of question marks? I’ll tell you. The “discovery” and “unearthing” if you will of graffiti, along with an amazing response in the press, for me, is a relevant milestone in the cultural time-line of New York and even America. Sound like a stretch? For thousands of years, people have been rediscovering works of art that were created by those before us. These works have been covered up, painted over, and in some cases obscured by unsightly but necessary furniture. In this case, rumors existed and were ignored that in the late ’70s and 1980s — a time when much of fringe art, including graffiti, was being validated- this particular wall was given to artists such as Basquiat, Fab 5 Freddy (who is featured in Wild Style and whose name still makes me think of Blondie), as well as Francesco Clemente by then art critic Edit deAk. Fast track to 2004 when the building was sold and in the process of being converted to high-end condo’s when developer Izak Namer’s son, became curious. The art and writings on the wall were found almost completely intact, except for gaps where a dishwasher and plumbing were installed years previously. In a what came first the chicken or the egg move, a new gallery is currently exhibiting the “wall” for the first time to the public. Gallery 151, located on Wooster Street in Soho, debuts with a show appropriately titled “The Wild Style Exhibit”. Treating the site like an archaeological dig, the kitchen cabinets came down with the gypsum board behind it. Another wallboard and a white tiled wall hid a smaller section of the mural, found in what had become a bathroom. Finding themselves in possession of “an iconic piece that created the renaissance of what downtown became — a viable and interesting place to live,” the Namers say they set out to authenticate the wall. They consulted with Guggenheim chief conservator Paul Schwartzbaum, Dennison, Mugrabi and other experts. 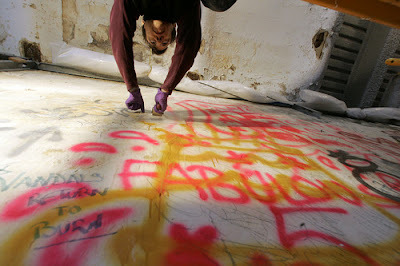 Graffiti and the “Downtown Scene” have both been exclusive as experience to American culture and particularly the birth of postmodern rebellion also evident in Punk Rock. The importance and relevance of this act of “rediscovery” and the acclaim that the work is receiving allows us to hope for a revitalization not only of downtown New York, but also of a reactionary movement that was all at once pertinent and symbolic in its honest representation of a particular time in our history. Along with the introduction and hope to bring contemporary, heavily conceptualized art downtown, the New Museum, galleries-that will soon overpower the rats, and an unabashed excitement at the origination of urban tribalism, our contemporary experience is in heavy rotation. And luckily due to technological advances, the record no longer skips, but rather moves along rather seamlessly. Now if only the city had stepped in, restored the work and left it in-situ, would I say that real “history” had been born, or should I say flipped.